Hummus – Elly Says Opa! Don’t get me wrong – I never hated it, or anything of the sort. I was just never that crazy about it. Despite my affinity for beans (another food I didn’t enjoy until later in life), I’ve never really taken to the garbanzo. I can’t tell you how much I wish I loved hummus. Who doesn’t love it? No one I associate with, that’s for sure. I grew up in an area with a very large Arabic population, and I’m surprised our school lunches didn’t come with a side of hummus. It’s incredibly healthy, especially when you are pairing it with something like vegetables. And it’s always the appetizer people want, so I go along with it, but wish we’d ordered something else. I try a little bit and am usually pretty underwhelmed. After trying hummus over and over again I realized I liked it most when it had a decent amount of sesame and garlic flavor to it (which makes sense, since I’m just lukewarm on the garbanzo). It’s not that this doesn’t taste like chick peas – of course it does – but I just think the sesame flavor comes through maybe a tad more than your standard hummus. I do use a Middle Eastern brand of tahini, which seems a tad stronger than the kind in the regular grocery store, but it just may be a coincidence. We ate this with chicken shawarma and also on its own with some pita I lightly oiled and stuck under the broiler. 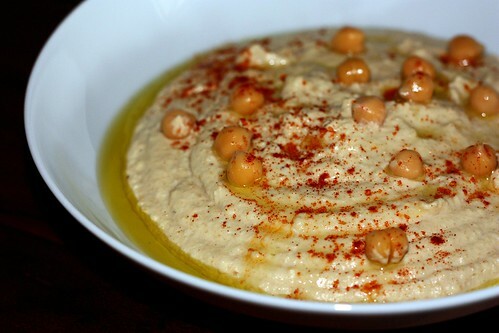 Add the chick peas, garlic, tahini, olive oil, and lemon juice into a food processor. Pulse until combined, and then stream in some of the reserved chick pea liquid until smooth (about 3 Tbsp.). Season to taste with salt and pepper. Serve with an additional drizzle of extra virgin olive oil and sprinkle of paprika.